Quebec’s notarial contracts—the earliest being dated 1626—help family historians to gather precious information about their ancestors. These contracts include deeds, wills, marriage contracts, donation records, inventories of a deceased’s estate, indenture records, service agreements, exchange of goods, settlements, as well as guardianship papers. Each party is provided with an original copy and an additional copy kept by the notary, called minute, is the one we may consult nowadays. Although you have to know the notary’s name to find a specific contract, life became quite easier since Ancestry put an index online—even if it’s far from being perfect. When I read a few months ago that Ancestry had launched an index for the Québec notarial records on its Website, I was very excited. It was a search tool I had long hoped for, but as I was not aware it was in the works, it came as a total surprise to me. Picturing the lives of the people in our family trees between 1780 and 1820 in what is now the Province of Quebec is no easy task. The parish records may provide some hints about their relationships but without a census and no indication about the date of death, there is not much to write about. That is when the notary records come in handy. It seems that some people had a close relationship with their notary. In small villages, their names keep coming back when reading the notary’s minutier (repertoire). Buying and selling lands, taking care of business; going to the notary’s office was no big deal for them. For others, it was a lifetime event, as it seemed to be the case for Antoine. But first, let’s take a look at what the parish records tell us about him. His parents, Joseph Tourville and second wife, Françoise Daunay, were married in 1766 in Lachenaie. Antoine, who was baptized on May 30, 1779 in Terrebonne, was the youngest child of the couple as my research led me to find two older sisters, Marie-Angélique, who probably died at a young age as there is no trace of her, except for her baptismal record in 1770, and Marie-Louise, who was born in 1773 and died in 1832. Antoine had numerous half-siblings, including Joseph Tourville, my GGG grandfather, married to Marguerite Fortin, and Michel Tourville, married to Catherine Marié. Antoine was not even three years old when his father died in 1782, at age 62. In 1789, a few months before his 10th birthday, his mother passed away at age 54. What happened to Antoine after his parents died? In fact, we would be in the dark if it wasn’t for a notary act telling the story of two major events of his life. Picture him, on that Friday, November 22, 1799, walking to Notary Joseph Turgeon’s office in Terrebonne, accompanied by his godfather, Joseph Limoges, the Town’s Militia Captain. On that day, Antoine is signing an agreement passed between Michel Rochelau dit Morrisseau and himself. Antoine thereby agreed to be his engagé (servant or laborer) for the next four years, from November 20, 1799 to November 20, 1803, which means he accepts to do whatever task Michel will ask him to do and, in return, he will get free room and board in Michel’s house as well as an annual salary of 132 pounds. 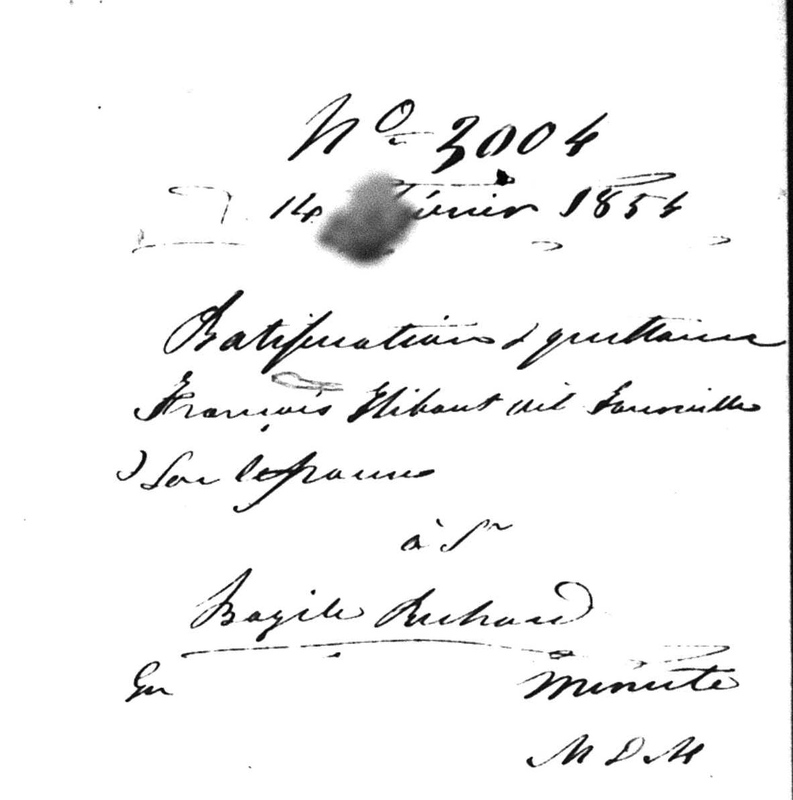 The contract also states that Antoine is satisfied with the agreement as he has been living in Michel’s house for 16 years. We therefore presume that, around 1783, Antoine is three or four years old when moving in with Michel Rochelau who got married with Marie-Archange Charpentier in 1782, the year Antoine’s father died. Maybe Françoise Daunay went there to work as a servant and she and her children went to live with that family. 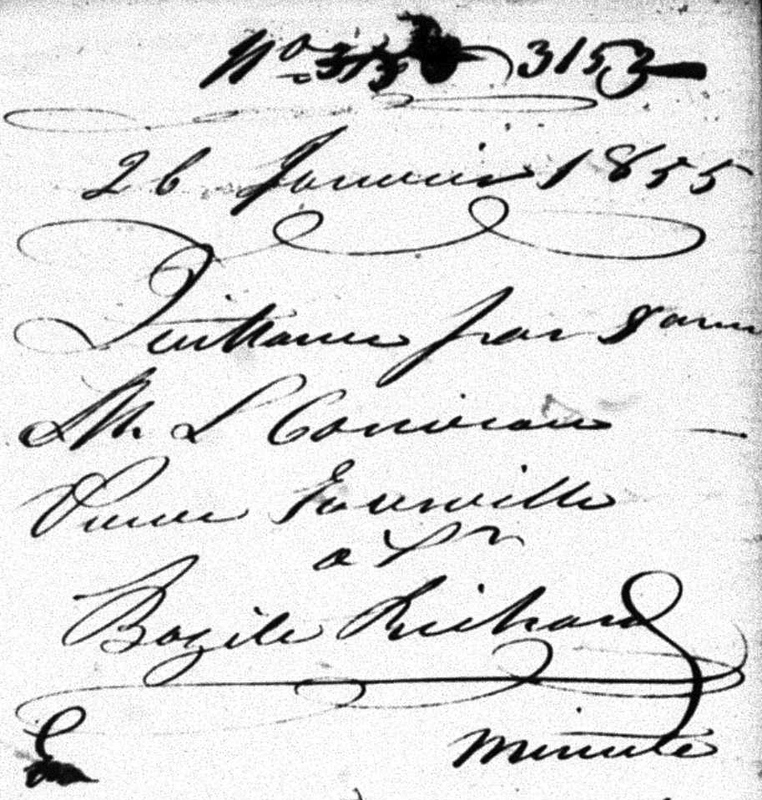 The notary’s act furthermore indicates, by a addenda to that act, that Michel and Antoine returned to Notary Turgeon’s office on April 30, 1803 when Michel agreed to pay Antoine what was due to him and cancel the agreement before the November 20, 1803 deadline. You may wonder why? A very simple reason. Three days later, Antoine married Josephte Amiot-Villeneuve in Mascouche on May 2, 1803. Antoine and Josephte are the first Montrealers of the Hubou-Tourville family in the 1800’s as evidenced by two baptismal acts found with respect to the couple in Notre-Dame church in Montreal: Joseph, born in 1803, and Josepthe, in 1805. These acts do not indicate the father’s occupation but when his son as well as his daughter got married at the said church, the records state that their “late father was a baker of the parish of Montreal”. The only clue pointing out that Antoine lived no longer than 33 years is to be found in Josephte Amiot-Villeneuve’s second marriage record on February 2, 1813, whereby she was identified as Antoine’s widow. 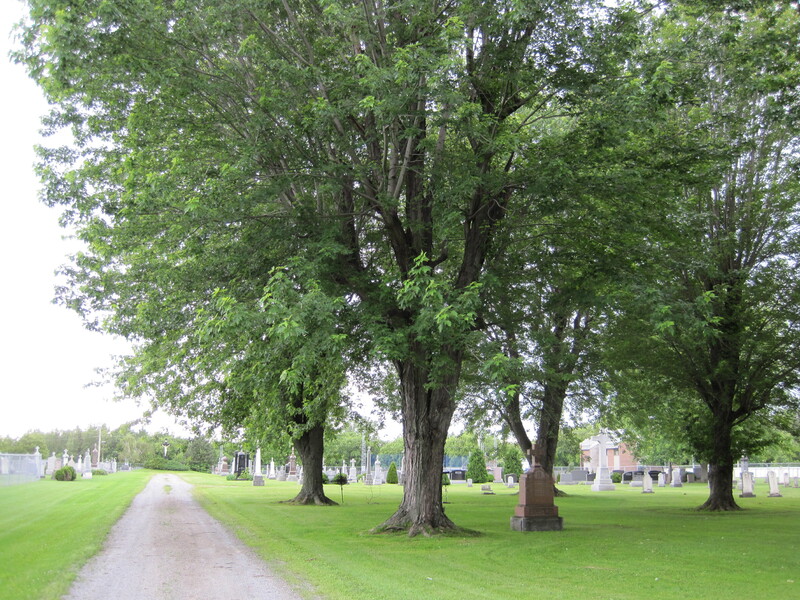 On the day of the wedding, she declared residing temporarily at l’Île Jésus (now Ville de Laval) but was a parishioner of St. Joseph Church in Rivière-des-Prairies (on Montreal Island). There were a lot of notaries in Montreal in the early 1800’s, so who knows? I may find some other clues about Antoine’s life. And who would have guessed that this man’s grandson, Louis Tourville, would be the co-founder of the Banque d’Hochelaga, now the Banque Nationale du Canada (National Bank of Canada) which, as you may know, is a major Canadian bank, in addition to being a very successful businessman in the late 1800’s, as well as a politician? I do have more than 52 ancestors to write about.